Zion Market Research has published a new report titled “Healthcare CRM Market by Product Type (Individual, Referral, and Individual and Referral); by Technology (Predictive CRM, Mobile CRM, Cloud-Based CRM, Social CRM, and Collaborative CRM); by Application (Relationship Management, Case Coordination, Community Outreach, Case Management, and Other Applications), and for End-User (Payers, Providers, and Other End-Users): Global Industry Perspective, Comprehensive Analysis and Forecast, 2017 - 2024”. 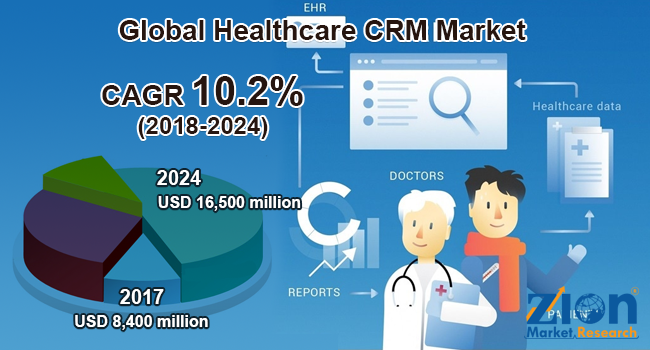 According to the report, global healthcare CRM market was valued at approximately USD 8,400 million in 2017 and is expected to generate revenue of around USD 16,500 million by end of 2024, growing at a CAGR of around 10.2% between 2018 and 2024. Customer relationship management (CRM) is a tool used as a strategy for managing interactions with patients; this technology aids in managing, coordinating, and automating the business processes. The adoption of information communication technologies (ICT) in the healthcare is growing at a high pace. The deployment of ICT, mainly the Internet, in the healthcare sector is commonly referred to e-health or electronic health, which is essential for enhancing the healthcare management for mutual benefit between healthcare providers and patients. One of the most significant features of e-health is to manage relationships between a health care provider and its patients (customer) in order to generate greater reciprocal understanding, confidence, and patient contribution in decision-making. The global healthcare CRM market is segmented as product type, technology, applications, by end-user, and by geography. Based on product type, the market is segmented as an individual, referral, and individual and referral. The individual and referral segment accounted for the highest share in the global healthcare CRM market in 2017. The shifting business model and rising demand for integration between provider, patient, and payer are significantly contributing towards the high share of segment in the global market. The referral segment is anticipated to grow at the highest CAGR over the forecast period. On the basis of technology, the healthcare CRM market is segmented as predictive CRM, mobile CRM, cloud-based CRM, social CRM, and collaborative CRM. Cloud-based CRM accounted for the major share in the global market in 2017. The mobile CRM is expected to register the highest growth of the global healthcare CRM market from 2018 to 2024 owing to the increasing adoption of solutions by the pharmaceutical companies, physicians, and patients. By application, the healthcare CRM market is segregated as relationship management, case coordination, community outreach, case management, and other applications. The case coordination segment includes pre-authorizations, patient information management, and referrals. The community outreach applications include community health education, financial donor management, and services promotion. The case management applications include clinical trials relationship management and chronic disease management. Case coordination segment is estimated to register a lucrative growth due to automation and centralization in the healthcare organizations. The growing prevalence of behavioral health problems and chronic disease is expected to propel the growth of case management segment in the coming years. Based on end-user, the healthcare CRM market is segmented into payers, providers, and other end-users. The insurance companies are considered under payers and hospitals, specialized clinics, and life sciences companies are included under providers. The payers accounted for the largest share in the global healthcare CRM market in 2017. Based on geography, the global healthcare CRM market covers key regions such as North America, Europe, Asia Pacific, Latin America, and the Middle East and Africa. Among them, North America is estimated to hold the largest share in the global healthcare CRM market and is expected to remain dominant over the forecast period. Some of the key players in healthcare CRM market include salesforce.com, IBM, SAP, Siemens Healthineers, Oracle, Accenture, Amdocs Ltd., Microsoft, AllScripts Healthcare Solutions Inc., Cerner, Anthelio Healthcare Solutions, and NetSuite.